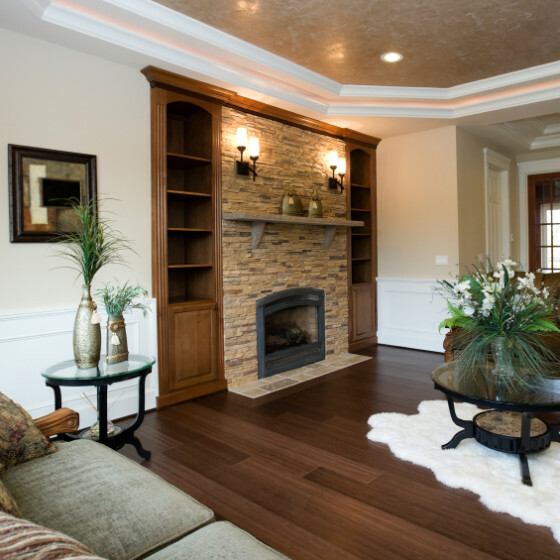 82% of estate agents recently surveyed said that homes with hard wood floors sold in a shorter time span and for a larger asking price than homes that did not have hard wood flooring, when asked by the National Wood Flooring Association in America. We have found that this is also true for the UK, with several previous customers selecting oak floors to install prior to putting their house on the market. Oak flooring is perfectly suited to creating a whole new look for any room. It is a very popular choice for people investing in their homes to prepare for sale to increase appeal and add value to the asking price. All of the oak flooring supplied by Oak Floors Online has its own unique appearance and some of our flooring can be finished to your own taste after installation. We supply both engineered and solid oak flooring, so you can choose the oak flooring best suited to the environment in your house and according to the benefits that appeal to you the most. As many estate agents will tell you (and all of the advice websites and books available! ), when selling your house, it often pays returns to invest in some home improvements beforehand to make the selling process that little bit more smooth and to make your house as attractive as possible to potential buyers. Many buyers today are looking for specific features in their new home such as large windows, lots of natural light and of course, hard wood flooring. At Oak Floors Online, we appreciate that the value of installing oak flooring in your house can add more than just value; the added desirability from the appearance and feel of oak flooring can be the deciding factor for some buyers between putting an offer in and going elsewhere. All of our flooring is of the highest quality and we have helpful guides available on our website to assist you with everything from choosing your free samples through to fitting guidelines and care & maintenance once your oak floor is installed. All of our engineered oak flooring is suitable for underfloor heating, which is something that will add a real wow factor to your house when people come to view and will keep you warm and toasty underfoot whilst you are waiting for the offers to come in! You can select from a variety of finishes, from unfinished that you or your prospective buyer can finish to individual taste after installation, to a double brushed and dark oiled finish or the truly unique celtic character rustic finish. Two rooms that are especially popular for making changes to in preparation for a house sale are the main living room and kitchen, two of the most-used rooms by not only people who live in the house but also by guests. If you can make these two rooms as appealing as possible, in whatever way you choose, the feedback from estate agents is that many buyers will allocate a lot of their consideration to how they feel about these two rooms of the house as much as for when they have company as for their own time at home, so it is important that they are looking the best they can when people come to view. Whilst installing oak flooring is a financial investment, it may not be as straightforward to quantify your return on investment in pence and pounds when it comes to putting your house on the market. What you can be sure of is that for those potential buyers looking for oak flooring in their new home, you have made your house more desirable than houses without that would require extra spend after purchase and that for many people, new flooring could be the difference between putting an offer in and not putting an offer in and could mean that your house is sat on the market for less time than if you had not invested in increasing its desirability. Of course, you may not be looking to put your house on the market and may simply love the look and feel of oak flooring and want to create a new look in your home – whatever your reason for buying solid or engineered oak flooring, we are here to help!